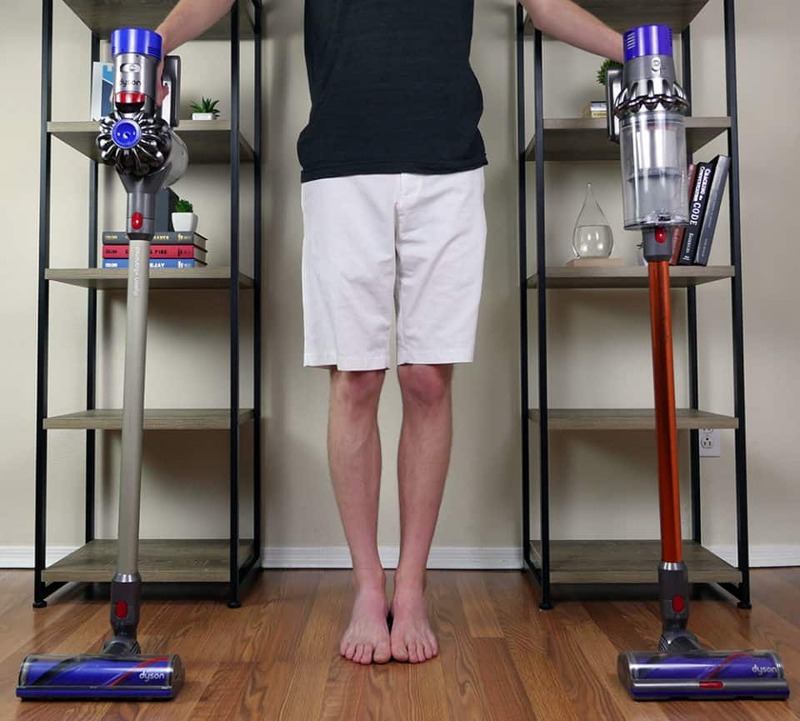 This vacuum comparison review is going to look at the Dyson V8 vs. V10 Absolute vacuums and put them to the test. 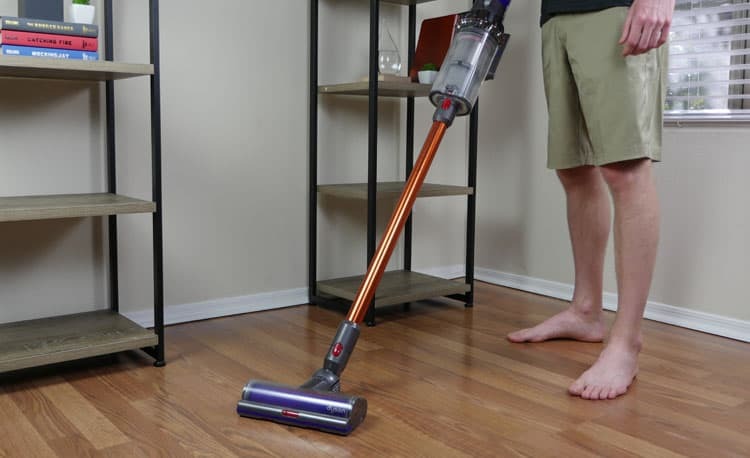 Both of these vacuums are powerful stick vacuums that are at the top of Dyson’s lineup. But is the Dyson V10 worth the extra cost over the V8? Continue reading below to find out. What are the Dyson V8 & V10 vacuums? 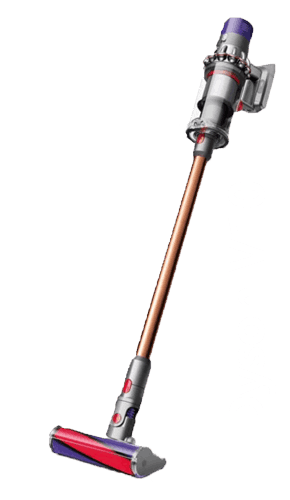 Both the Dyson V8 and Dyson V10 are part of the Dyson V-series. There are currently 4 stick vacuums within this line, including the V6, V7, V8, and V10. Generally, Dyson releases a new model each year. he Dyson V10 is the newest and most powerful vacuum and, like most V-models, is available in Absolute, Animal, and Motorhead versions. Prefer to watch rather than read? 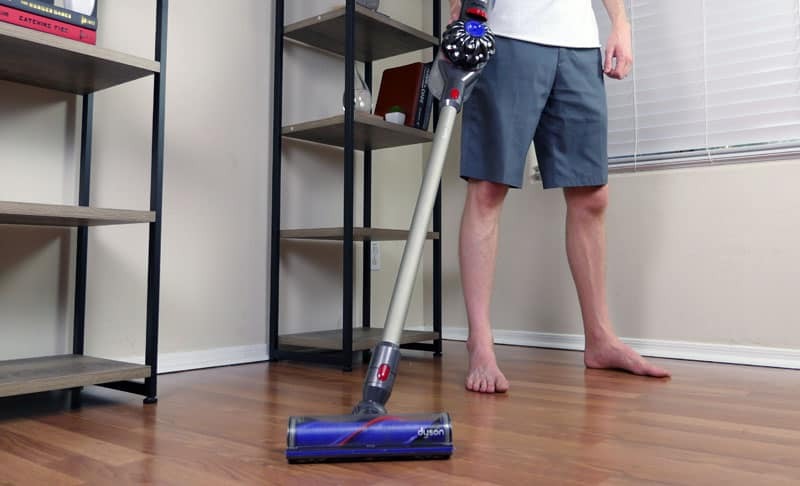 See our comprehensive Dyson V8 vs. V10 review video below. The design of the Dyson V8 vs. V10 looks fairly similar. Both of them are about the same size and follow the same clean aesthetic patterns, using color to denote special features or capabilities for each model. Both vacuums also have a on / off trigger switch which powers the vacuum. If you’re not holding down the switch, your vacuum will stop running. This can be a handy feature for conserving battery life. 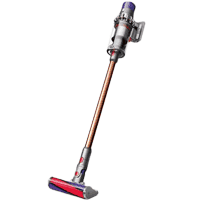 Both the Dyson V8 and Dyson V10 are also designed to alternate between a portable handheld and a powerful stick vacuum. Easy to use accessories are designed with “quick release” latches that make it easy to go back and forth as you clean. (Note: Older models, like the Dyson V6, do not have the “quick release” capability on their accessories). The biggest difference in design is the cyclone system and dust bin. On the Dyson V10, the cycles have been reworked for a more streamline look, which resulted in a larger dust bin as well. These small changes in design make a powerful impact on the overall cleaning performance of the Dyson V10. How Does the V8 & V10 Clean? CYCLONE DESIGN | The Dyson V8 and Dyson V10 both rely on Dyson’s patented cyclone cleaning system for powerful suction. Both vacuums uses a 15 cyclone system, arranged across two tiers, but they look very different. In the case of the V8, the cyclones and dust bin are designed perpendicular to the extension wand and cleaning head, creating a “T”-like shape. Whereas, with the V10, the the dust bin is parallel to the cyclones and extension wand, creating a more streamline look. The V8 comes with a “Direct-Drive” cleaning head and may also include the Fluffy cleaning head, depending on the specific model you select. For example, the V8 Absolute comes with both cleaning heads, while the V8 Animal only includes the Direct Drive option. The V10 comes with the Fluffy cleaning head (for hard floors) and the Torque Drive cleaning head (ideal for carpet, but safe for hard surfaces). These cleaning heads are interchangeable and with the push of a single button you can easily snap the alternate cleaning head in. 2-IN-1 DESIGN | The Dyson V8 and Dyson V10 both operate as a stick vacuum or portable handheld vacuum. When used a stick vacuums, the extension wand acts as an intermediary between the canister and the cleaning head. As a handheld, the cleaning tools snap directly into canister and you’re good to go. How big is the V8 and V10? The difference in size between the Dyson V8 and V10 feels pretty negligible. The V10 model is 2/10″ taller than the V8 and 0.15 lb. heavier. Is that a back-breaking difference? Not likely—so for the sake of this comparison, we’re going to call it a draw for size and dimensions. What accessories come with the V8 & V10? The Dyson V8 and Dyson V10 have been very comparable up to this point, but what about accessories and parts? Is this where one breaks away from the pack? Honestly, not really. Both of these vacuums have an almost identical collection of available parts and accessories. Please note that the table above indicates accessories that are available with the Absolute version of the Dyson V10 and V8. Other versions (ex. Animal, Motorhead) include a subset of these accessories. The Dyson Animal includes everything except the soft “fluffy” cleaning head. The Dyson Motorhead, which is the least expensive, includes only basic accessories. First thing first, is the cleaning head. Dyson offers three different cleaning heads for the V8 and the V10. Direct Drive cleaning head: This is only offered on the V8, not the V10. It is best used for vacuuming carpeted floors and fine debris. Brush agitators spin and help release dirt and debris from deep within carpet fibers. Torque Drive cleaning head: This cleaning serves the same purpose as the direct-drive cleaning head. It’s best on carpets, but is safe on hard surfaces. Fluffy cleaning head: This is a soft roller cleaning head, best used for vacuuming up large debris from hard floors. This cleaning head is available with the Dyson V8 or the V10 model. Mini soft dusting brush (quick release): has soft bristles that dust and clean furniture, baseboards, blinds, etc. If you purchase from Dyson.com, you also have the option to add any additional three cleaning tools at no extra cost, when you auto register your vacuum. With the V8, you can choose from an extra mini soft dusting brush, a replacement wand (yellow, titanium, pink, or red), up-top adapter, the mattress tool, or a Dyson tool bag to keep in the car and hold all your tools. Similar to the V8, the V10 can also add three free tools with auto-registration. With the V10, you can choose from the up-top adapter, the soft dusting brush, mattress tool, or Dyson tool bag. Both Dyson V8 and V10 can reach into high corners and difficult to reach places. When cleaning hardwoods, the Dyson V8 and V10 had similar results (mostly). Both the V8 and V10 did an excellent job of collecting rice, kitty litter, and sugar. However, the V8 did struggle more with the cereal test compared to the V10. That said, we did have the fluffy cleaning head for the V10, but we did not have it for the V8. Had we had the Dyson V8 fluffy cleaning head I expect the results would have be more similar. For the low pile carpet test, we continued to use the V8 Direct Drive cleaning head and switched the Dyson V10 to the Torque-Drive cleaning head. With these heads, both the V8 and the V10 had a nearly flawless performance on all debris tested on low pile carpet. Lastly, for high pile carpet, performance was exceptional. All tests for both the V8 and V10 scored 99% or above, with the exception of the V8 rice test which scored a 93%. Still, this is a great score concerning overall cleaning performance. 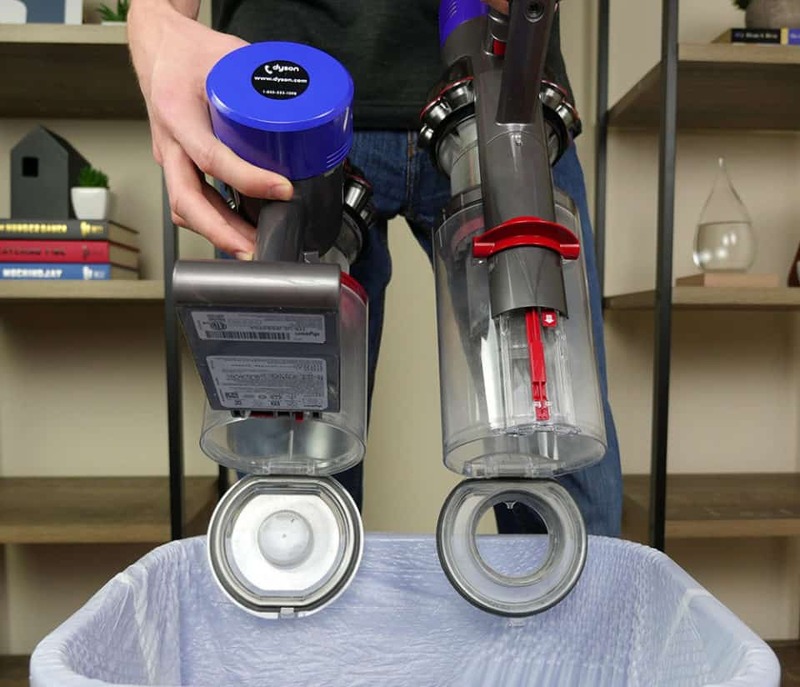 For our full testing data (in addition to before and after pictures) on all floor and debris types see our complete Dyson V8 review and Dyson V10 review. How easy is it to use the Dyson V8 & V10? Regarding usability, the Dyson V8 vs. Dyson V10 are quite similar. Both vacuums arrive pretty much assembled, with extra parts. To assemble the vacuum, all that is needed is a few “quick release” latches. These red buttons are a Dyson staple in stick vacuum models released after the Dyson V6. With a push of a button, these latches allow you to quickly and easily snap new accessories in or reconfigure your stick vacuum. RELATED – Wonder how the V10 compares to the V6? Find out in our Dyson V6 vs. V10 vacuum battle. Setting up these stick vacuums is also pretty simple. Before running a clean, make sure to charge the vacuum fully. You can either use the wall docking station or simply plug the vacuum into the wall using the provided charger. When using the V8 or V10, the daily use is also very similar for these vacuums. They turn and off the same way, using a pressure-trigger, although the exact location for the button is in a slightly different spot. To conserve battery life, these vacuums will only run if your finger is on the trigger. Emptying the dust bin is one of the key differences in how these vacuums operate. With the V8 vacuum, there is a latch at the top of the vacuum. Give it a pull and the top part of the cyclones slide up, unlatching the dust canister and allowing dirt and debris to fall into the trash can. With the V10, there is a sliding latch on the side of the unit. With this style, they take a “point and shoot” approach. Simply place the canister over a trash can, point, and slide the latch… or shoot. As it slides the dust bin opens and the debris falls out. Because these vacuums are so similar in size, the maneuverability is also basically the same. Squeeze under sofas, use the crevice tool for the hard-to-reach-places; with Dyson’s various attachments, there is a wide range of places you can use the V8 or the V10. What are the Dyson V8 & V10 maintenance costs? The maintenance costs for the Dyson V8 vs. V10 are notably different. The Dyson V8 will cost $32 / year in maintenance costs. The Dyson V10 will cost $0 / year in maintenance costs. Both the Dyson V8 and V10 use a lifetime washable HEPA filter. The V8 has a lifetime washable central filter also. You only need to replace these if they are damaged or lost. Beyond that, the only part to maintain is the battery. In the case of the Dyson V8, you can expect it to last 2’ish years (warranty will cover it within the first 2 years). The Dyson V10 is another story. Dyson’s founder, James Dyson, has been quoted saying the V10’s battery will last 15 years. Making the replacement costs effectively zero (since you’ll probably upgrade vacuums before the battery is dead anyway). MORE – Have a specific cleaning surface you need to deal with? See our best vacuums for hardwoods and best vacuums for carpets guides. The battery between the V8 and V10 is certainly a point of upgrade. The V10 uses a seven-cell, nickel-cobalt-aluminum battery that can power the vacuum for up to 60 minutes. Comparably, the V8 uses a lithium-ion battery with a 40 minute run time. With both of these vacuums, if you’re using the “Max Power” mode or motorized tools, you can expect the run time to be significantly less. Is the V8 or V10 quieter? Concerning noise, the Dyson V8 is just slightly quieter, about 73 dB from 3′ away, compared to the V10, which is closer to 75 dB at 3′ away. So overall, I would say that the value of the Dyson V8 is pretty good. Strictly looking at cleaning performance, this vacuum was able to keep up with the V10 on most all cleaning tests. The design is similar to that of the Dyson V10, in terms of usability and aesthetics. The big difference in design is the position of the dust bin. The V8 comes with the Direct Drive cleaning head which seemed to do an equally as good of a job at cleaning as the Torque Drive cleaning head (with the V10). The V8 comes with the same accessories as the V10 so that’s a bit of a wash. Considering that the Dyson V8 is notably less than the V10, it’s overall value is pretty good. Unless you need the extra long run time of the V10, the V8 would likely suit all your needs. RELATED – Is cost the most important factor for you? Take a look at our best cheap vacuums guide or our Dyson V6 vacuum review. As for the Dyson V10, I would say it’s perhaps not as good of a value, considering the higher price tags, but if the new features of the V10 are of critically important, it’s overall value may increase to you. Despite the value being slightly worse, it is still objectively the best Dyson vacuum we’ve tested to date (and arguably the best vacuum on the market). For instance, the new design of the Dyson V10 has increased airflow and because of that, it offers 20% stronger suction, compared to the V8 stick vacuum. In addition, it also has a stronger motor and longer battery life. If you have a larger home or simply don’t want to charge your vacuum as often, the V10 battery could be a better value for you. RELATED – For more information on Dyson’s vacuum lineup see our complete analysis in our Dyson vacuum reviewsguide. Weight 5.75 lbs. 5.9 lbs. The Dyson V10 runs off the V10 digital motor has 20% more suction power, compared to the V8, according to Dyson. The Dyson V10 has been redesigned to have more efficient airflow and more powerful suction. The cyclones, dust bin, and cleaning head have all been aligned to help to provide stronger suctionand help the vacuum be more efficient. The Dyson V10 also uses an improved, fade-free battery that allows for up to 60 minutes of run time, compared to 40 minutes of run time on the V8. The Dyson V8 is a great option if you want a longer run time than what is offered with the Dyson V6, but don’t want to pay the high price tag for the Dyson V10. Looking specifically at cleaning performance, the V8 was a real contender against the V10, coming within a percent or two for most of the tests. Want a lower price – With the new release of the V10, older Dyson models, like the V8 are dropping in price, but they are still a well-built machine. Purchasing a model that is a couple years old can be a great way to snag a deal, as is the case with the Dyson V8. Don’t need the extra run time – The 20-minute run time of the Dyson V6 may be a little short for some people, while the 60-minute run time of the V10 could feel a little excessive. If you want sometime in the middle, the V8 provides that middle-ground between quality and value. 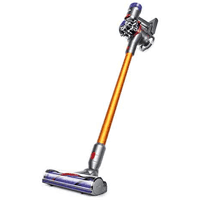 Want multiple cleaning heads – If you want two cleaning heads, the V8 comes with the direct-drive cleaner head as well as the soft roller cleaner head (with the V8 Absolute model)..
For more information or to buy check out the Dyson V8 on Amazon.com. The Dyson V10 is the top-of-the-line model on the Dyson market right now. Dyson is such a fan of it that James Dyson himself was recently quoted saying that the launch of the V10 is “why I’ve stopped developing corded vacuums.” The vacuum is lightweight and portable, yet has a large dust bin and provides powerful suction. Want a longer run time – Compared to the V8, the V10 offers 20 extra minutes of run time, for a total of a 60-minute run time. This run time is when running on standard power. If you’re using motorized tools or the “Max Power” setting, run time will be less. You Want stronger suction – The redesign and alignment of the dust bin, motor, and cyclones results in a vacuum that looks more “streamline” and offers 20% stronger suction over that of the V8 stick vacuum. Want a larger dustbin – the V10’s dustbin is 40% larger than the Dyson V8. You Want the Torque Drive cleaning head – As an upgrade to the direct-drive cleaning head, the V10 model comes with a torque-drive cleaning head. Both the V8 and the V10 are available with the “Fluffy” soft roller cleaning head. For more information or to buy check out the Dyson V10 on Amazon.com. April 12, 2019 – Further formatting and layout improves. Clarified a few points. March 31, 2019 – Overhauled layout and formatting. Chances are high Dyson will release a new model within the next 2 years. However, it definitely won’t make the V10 obsolete. Even though the V8 is several years old, it’s still an incredible value. Sure, the V10 is better, but the V8 is still arguably one of the top 3 vacuum sticks on the market. Is the new Torque Drive head significantly better than the Direct drive head ? I don’t think I’d say significantly. But it is noticeable. If you add the cost of the V8 battery that will need to be replaced after 2 years, And possibility of 1 or both filters needing replacement on the V8, vs only 1 filter on the V10, then the price difference between V8 and V10 might end up being much closer. However, there really is no reason to think you’d need to replace any of the filters. All of the filters are lifetime filters. Unless they are damaged or lost there will be no reason to replace them. What about differences in weight distribution and balance and how this may cause strain on the wrist and arm or back if using for 30+ min.? I have a very small hand and carpel tunnel. Which model’s trigger would be more comfortable and cause me fewer health problems? You noted the trigger was in slightly different place for both. I wonder if one may also be harder to keep pressed down for a good long time. I am doubtful that you would notice any major difference between the V8 and V10. Both are extremely lightweight, under 6 pounds (and within 0.1 pounds of each other). I would say the V10 is perhaps a bit more ergonomic, as it spreads the weight further down the unit, whereas the V8 has a more compact design. As far as holding the trigger goes, I don’t think you’d notice a difference. The weight of the vacuum means you aren’t holding the trigger as much as you are just holding the vacuum upright with your finger in that position. Unfortunately I am in the market of buying another Dyson Stick since my last one is no longer working… it fell too many times…. As much as we love our dyson, the one complaint is that it does not stand-up on its own. It’s forever falling to the floor when I try to lean it against a wall. That is the unfortunate case for most stick vacuums. Dyson (and others) does offer a wall mount though. So it may be worth installing that with your new Dyson. I have read that the V10 has rubber pads under the battery that provide enough friction to stop it slipping down the wall that you might be leaning it against. That is true. It does have a rubber gripper pad on the top back of the battery, so you can more easily lean it against a wall. Would still probably be best to use the wall mount, but if you really don’t want / can’t wall mount, it’s not bad. My name is David. I am a parent and we own a big house. We have a 5 year old daughter and she always play with the vacuum cleaner. We are very worried about her safety yet we want a vacuum cleaner that can clean the house quickly. In this situation, what vacuum cleaner do you suggest me to buy? The safest option would probably be either a Dyson V-series vacuum or a robot vacuum. The biggest vacuum dangers for children are going to be 1) suction that grabs hold of hair or small hands and doesn’t let go due to continuous power and 2) cords that could become a strangulation hazard. With the Dyson V-series vacuums you have to hold the power trigger to activate the suction. So there is less of a risk that should could hurt herself with the suction (and of course it’s cordless, so no risk there). With a robot vacuum, you have a cordless design and when you pick up the robot vacuum it will turn itself off. So even less risk there. As far as the Dyson goes I think you’re on the right path with either the V8 or V10. Those are the two top models currently. In any case, I think it would be best to always supervise her while she’s using the vacuum. These are still powerful machines and they can be dangerous to children. Do you have experience with replacing the battery in the V8? Is it really necessary after 2 years? In my opinion, when buying such an expensive tool, it should last way longer. At least 10 years. I have not replaced a V8 battery. It very well may last longer than 2 years. I put that as a very conservative estimate (since that’s what the warranty covers). Other readers have told me their battery lasted in the range of 4 years. So it really just depends on use. great video on explaining the dif between v8 and v10.currently have the v8 will buy the b10 as soon as I can save enough money. You’re comparisons, analysis and easy to understand information is just awesome. I’m considering a new stick vacuum and this site has been so helpful. Not sure yet if I’ll go with the Dyson…cost is hefty for me, but I just may go for it with all the benefits you outline. Thank you! Thanks so much, Lynn! I’m glad we could help. If you have any specific questions I can answer don’t hesitate to ask! Hello, I just bought a V10 Animal, and realized that it does not come with the fluffy head attachment. i am very worried about scratching my hardwood floors with the Torque Drive Cleaning head. is it REALLY ok to use this on hardwood floors? Can i buy a Fluffy head attachment? HELP! Thanks so much! It is perfectly safe on almost all hard surfaces to use the multi-surface cleaning head that comes with the V10 Animal. I use it on my hardwood floors all the time (an engineered hardwood floor) and it has never left a scratch. The V8 is still an amazing vacuum in its own right. If you have high pile carpets that tend to have pet hair buried in them I would suggest going up to the V10. If not, you will probably be fine with the V8. For my budget i can get the Dyson V8 absolute or the Dyson V10 Motorhead. i have quite a small appartement and no pets. I do have some carpets. If you have mostly carpets and no pets, go with the V10 Motorhead. It’s going to be the better performer and value in that situation. I have been on the fence. I have cord free (cheap) vacuum that could that has about as much suction power as a backwards whistle. I am really looking at Dyson – run time, suction power, ease of use, cordless. Buying a Dyson is akin to buying a car. Way too many choices. An tv shopping channel has the Dyson V8 Animal Pro Cordfree Vacuum on “sale” for $299. Came to your site to see the differences. Your breakdown is brilliant. The best I have seen on the internet. Wish I could subscribe to your site. I know when any Dyson is on “sale” there is a new one coming out. I have seen this before. Thanks for this superb review. Thanks so much for your kind words, Sandy. I’m glad our guide was able to help! There is a good chance Dyson will release a new product within the next couple of months. Every year for the last 4 years they’ve launched a new stick vacuum. So we probably will see the Dyson V11 (or something similar before summer). Nevertheless, that doesn’t mean the V8 is a bad vacuum by any stretch. V8 and V10 will continue to be exceptional vacuums. Curious on your opinion on the new V11 Torque. Just saw the advertising for it, after just having had purchased a V8 Animal. Price is twice the cost, and wondering if I want the latest and greatest, or should I just stick with the V8. What’s your opinion? We are actually in the process of testing and writing up our full review. Performance wise, it’s just as good as the V10. But I’m not sure it’s actually that much better. It has the same run time, same accessories, and same torque driving cleaning head as the V10. However, Dyson is just including one cleaning head (a multi floor) and doesn’t include their soft roller brush. So if anything, it’s probably a bit worse on hard surfaces (it flung rice around in our test). Where it’s better is raw suction power, which increases from 150 to 185AW. Additionally, the intelligent suction is pretty cool. We should have our full V11 review live late today or tomorrow at the latest. So look for that on the home page and in the main menu. Help! I have a 600-ft mostly carpeted floor apartment (the kitchen and bathroom are tiled), no pets, and have been thinking about getting a Dyson stick vacuum cleaner. I’m leaning towards the Dyson V10 Absolute but with my small-sized flat I’m wondering if I should ultimately go for this model, or if, on the other hand, any of the V8 versions (either the Dyson V8 Absolute or Dyson V8 Animal) could serve me just as well in the long run, or at least over the next 4-5 years? Your comments would be extermely appreciated. At the end of the day, you’re hard pressed to go wrong with either vacuum. If you’re looking for something for the next 4-5 years I would suggest you go with the Dyson V8 Absolute. It’s a great vacuum and the battery should last around that time frame. If you want something where the battery is able to last longer, go with the Dyson V10 Absolute. If you have allergies or otherwise just want to be able to remove small particulates I would suggest the Absolute model in both cases. But if you’re not as concerned about that you could get the V8 Animal or V10 Motorhead to save a little money. I have had a Kirby for the last 15 years and a small corded stock vacuum. Kirby has some pieces broken and way to heavy to clean a 3200square foot home. All hardwood floors and tile with area rugs and some carpet in the basement. Looking to replace both of these vacuums with a dyson. Not sure which one to go with. V8 or 10 and what are the options they each have? If you scroll up, you’ll see “What accessories come with the V8 and V10?” This section has a table with the full list of all accessories and options that are included on both the V8 and V10. For a more detailed list of options and features please see our full standalone reviews. Sorry i meant the differences between the different v8 models and v10 models. For example, if i went with a V10 which v10? Check out the standalone reviews that I linked before. Each standalone review has a table about halfway down that lists the differences between each sub-model. Unfortunately, they are more comprehensive that I can really cover in a single comment.